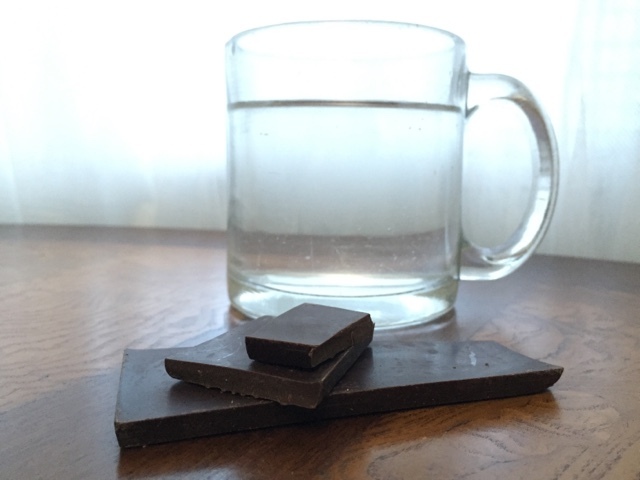 How do you cleanse your palate for chocolate tasting? I use water at 140 degrees farenheit as a palate cleanser. Any time I sample chocolate for palate training, or when tasting to identify flavor notes and texture, I start with palate cleansing. My routine is pretty simple. Purified water at 140 degrees. I have a hot water kettle that measures the temperature of the water. Some things require consistency and accuracy. Varying temperature in my mouth could impact my perception of the melt, texture, and even the level of sweet. The heat of the water leaves my mouth at a consistent temperature for each tasting. It also melts away any residual chocolate if I'm sampling several bars or confections at one sitting. Some people prefer bread or crackers, even corn meal mush. I'm not saying they are wrong, each person has their own routines. I like to keep it simple and make sure my palate is free from any flavor, no matter how bland. Added bonus: Gluten free. Dairy free. Calorie free. And we are all supposed to drink more water, right? Enjoy some craft chocolate today.